One week after Wisconsin news anchor Jennifer Livingston addressed a viewer on the air who sent her an email calling her "obese," she appeared on The Ellen DeGeneres Show and RadarOnline.com has the hilarious clip. Jennifer, 37, teamed up with Ellen DeGeneres to shoot a promo that will air before her daily morning show and she's shocked with two surprises — a celebrity cameo and a gift from the talk show host! 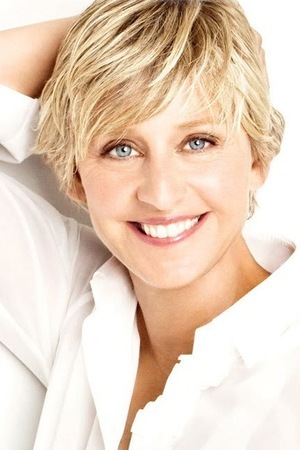 "Hi, I'm Ellen DeGeneres and when I visit La Crosse, Wisconsin I wake up with Jen and Bill on News 8 This Morning and then I go back to bed because a Cover Girl needs her beauty sleep," Ellen jokes. And when Jen "throws it over to Randy with sports," the audience is surprised to see it's actor Matthew Perry filling in for Randy. "Hello there, stepping in for Randy I'm Matthew Perry. I don't want to talk about sports, I want to talk about Jen and Bill. You should watch them every weekday morning from 5 to 7 on News 8," Matthew says, and takes the opportunity to plug his new show, Go On. Ellen then has Jennifer read the teleprompter which reveals a surprise trip for the mother of three. "This is very exciting because the winters in Wisconsin can be so cold and Ellen thinks I deserve a little break," Jennifer reads in shock. "And you are sending me to the Caribbean for a five-night trip?" As RadarOnline.com previously reported, personal injury lawyer Kenneth Krause wrote a bullying email to Jennifer in which he said she was obese and wasn't "a suitable example for this community's young people, girls in particular." Jennifer immediately shot back at the viewer's letter with a 4-minute segment on her show saying, "The truth is, I am overweight. You can call me fat -- and yes, even obese on a doctor's chart. "But to the person who wrote me that letter, do you think I don't know that? That your cruel words are pointing out something that I don't see? You don't know me. You are not a friend of mine. You are not a part of my family...you know nothing about me but what you see on the outside, and I am much more than a number on a scale." Despite public outrage, Kenneth refused to apologize and instead offered Jennifer help to get her healthy!